Stop & Shop workers are still on strike. Here’s what you need to know. - Hartford Courant Stop & Shop workers are still on strike. Here’s what you need to know. More than 30,000 Stop & Shop employees from 241 stores in Connecticut, Massachusetts and Rhode Island are on strike over issues ranging from health care costs to pay and benefits for future workers to working on Sundays. Company management says the supermarket industry is undergoing rapid change, with the arrival of online delivery and many non-union competitors. Stop & Shop stores are open, but with limited staffing between the hours of 8 a.m. and 8 p.m. Striking workers are walking picket lines in front of stores, urging customers to shop elsewhere. Nobody knows, but pressure is growing as customers will be forced to look elsewhere to shop for Easter and Passover. 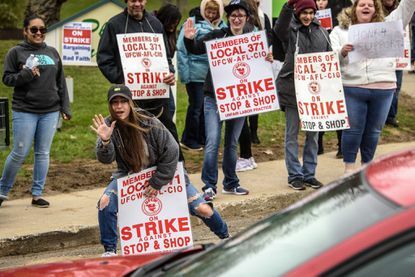 Management and union leaders have been meeting in Providence and negotiating again, but there have been no signs that the two side are close to an agreement. Union leadership has been telling employees that the dispute is not about raises for current employees, but about the cost of health care and compensation for future workers. The five unions representing 31,000 employees in Connecticut, Massachusetts and Rhode Island say they are also concerned about paying a larger share of health care premiums. The union is also opposing elimination of extra Sunday and holiday pay for part-time workers. What does Stop & Shop management say? A worker with a family would pay $38 in each paycheck by 2021, up from $20 or $26 now. The company said the share of coverage costs workers would pay for family coverage would increase to between 6% and 8%, from about 5%, which it said is less than the national average. Why hasn’t Stop & Shop come to an agreement with its employees? The company said it needs to make these changes in order to remain competitive, adding they are one of the few remaining union grocers in New England. Union officials have balked at this and point to a financial report for Ahold Delhaize, Stop & Shop’s Dutch parent company, showing more than $2 billion in profit in 2018 as further evidence the company is doing fine. What’s going on in the supermarket industry? The supermarket industry faces troubling changes: Rising online competition from Amazon and meal preparation startups such as Blue Apron, according to IBISWorld, a research group. The trend is expected to continue over the next five years with e-commerce sales seen rising at an annualized rate of 8.3 percent. The steady growth of online grocery services will “hamper industry revenue growth in the coming years,” IBISWorld said. In addition to online competition, online pickups, such as Wal-Mart’s service, are expected to “surge in popularity, further threatening industry sales,” IBISWorld said. Stop & Shop is in the midst of a $2 billion upgrade of its stores.